Margaret and Julian Allen raised two sons in a suburb of Dayton, Ohio. One day at college their younger son, Will, notices a small lump on his neck, which is diagnosed to be melanoma. Over the next two years, Will and the family live through ups and downs, doctors and hospitals, hopes and fears. Ultimately, the story does not have a happy ending. And yet, in a way it still does. 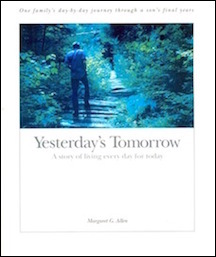 Margaret Allen kept a detailed diary of her family’s experience- as it unfolded, day after day. Her dying son, an enthusiastic writer all his life, also documented his thoughts in a journal. This book combines both of their perspectives. The result is a powerful look into how a family copes with tragedy, finally loses their son, and yet endures- grateful for the all-too-short time they had with him. Ultimately, this is a story not about death, but about a family, about strength, and about love.